Welcome to the CTMH August Stamp of the Month Blog Hop! First of all, I want to tell you about the new pricing structure for the Stamp of the Month. As many of you already know, for a long time you've been able to get the SOTM at a discount with a qualifying purchase....spend $25, get 25% off, spend $50, get 50% off, spend $75, get 75% off and if you spent $100, you got it for free. Who doesn't love free? I love free, but sometimes I just couldn't spend $100 to get it for free. Maybe you can relate? Well, starting this month, Close To My Heart is once again, helping crafters get their hands on their stamps, by making them even more affordable. One way they've done this is by lowering all of their stamp prices! I mean...really...who does that? It was announced in mid July at convention and I'm still having a hard time believing it. But it's true. Stamps that formerly cost $34.95 are now $29.95. Stamps that were $22.95 are now $17.95. Stamps that once cost $13.95 are now $9.95. Finally, stamps that cost $7.95 are now $6.95. Well, CTMH didn't stop there. They also made the Stamp of the Month more affordable. Now, you can purchase the SOTM like any other stamp (but only during it's assigned month) for $17.95 or get it for only $5 when you make a purchase of $50 or more! Okay...now, I don't know about you, but I have a really hard time not spending $50 when I go to a scrapbook store, craft store, etc. LOL I really believe this pricing structure will allow more people to be able to obtain and play with the stamp of the month! Woo hoo! (Doin' a happy dance). :) Also, something new about the SOTM...it includes an insert with photos of ideas on how to use the stamp set, along with the link for directions. I swear...they just keep making it better and better! It was a bit of a challenge, because I don't celebrate Halloween and am definitely not into witches, ghosts, etc. However, I have to tell you I am in LOVE with the honeycomb image. I can't wait to get around to recreating an autumn layout I saw at convention that used the honeycomb image on the background paper . Once I get it done, I'll post it here...but it will probably be awhile. ;) (I have to return to school on Wednesday....good-by summer break.) Anyway, I do enjoy trying to use stamps in other ways then they were intended and that's what I tried to do with this stamp set. The swirls around the legs are from the witch's hat and the grass is from the broom. Here's a closer look at the flowers. I cut these with the new Cricut Art Philosophy Cartridge, available only through Close To My Heart. It is the same flower, one cut at 3" and one at 2". If you look closely, you'll notice that I rolled the petals just a little differently. In the larger flower, I folded over the scallop part of the flower petal as I rolled and let each layer cover them. On the smaller flower, I rolled over the scallop part of the petal, but didn't let it get covered with next layer. I'm not sure my description makes any sense, but hopefully between the cryptic description and my photos, you can make sense of it. LOL Also, it's hard to tell in the photo, but I frayed the end of the striped grograin ribbon...love this ribbon. 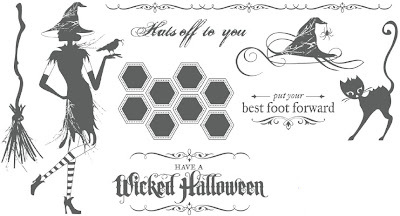 Remember, if you love what you've seen so far along your SOTM Blog Hop journey, and you want your own "Wicked" stamp set or want to get it for the low, low price of $5, be sure to contact your Close To My Heart Independent Consultant. If you don't already have a consultant, I'd love to be yours. You can find details on the "Stamp of the Month" here on my blog, or by clicking on the "Stamp of the Month" tab at the top of the page or by clicking on the "Shop with Me" link near the top right. Of course, if you have any questions, please don't hesitate to contact me. If you have time, take a moment or two to check out the rest of my blog. If you enjoy your visit, then please consider "Following Me", signing up to receive blog updates, and/or leaving a comment (we all love comments...the nice ones anyway), then be sure to continue along on the hop by heading over to Nancy Brown's blog, "Creatively Artsy Card Gallery" and check out her creation. WOW what a great card. Love the color combinations. Love your card! The roses are fabulous, and I like the swirls and grass with those cute stockinged feet. What a fabulous card! Love! Oh My what a fabulous card. 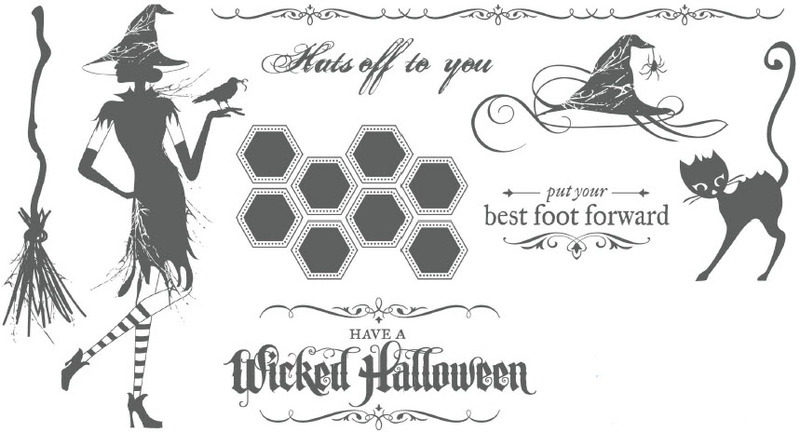 Can't wait for my cricut cart to get here. Love the flowers, great card! Love what you did with this stamp! so creative! Tamytha, this is so SWEEEET! I especially LOVE how you used the broom to make grass - way to think "outside-the-box"!! 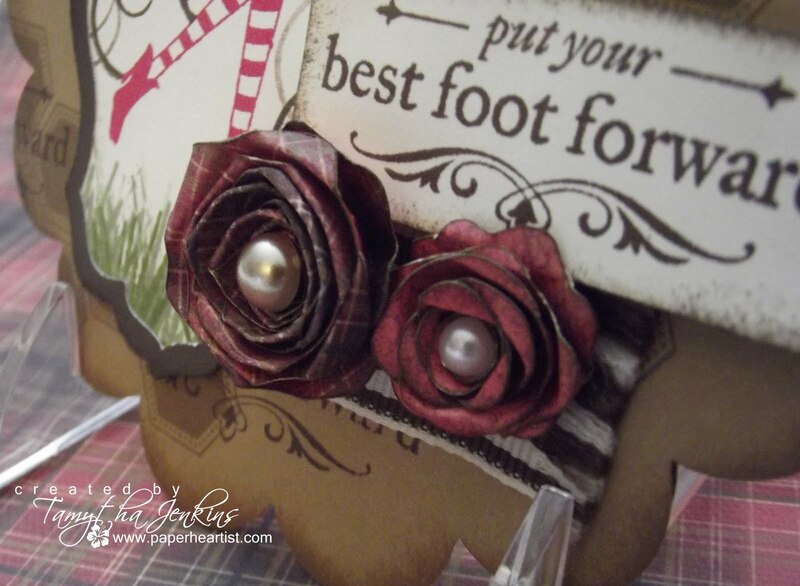 Fabulous card, love the rolled roses!!! I am in love with your card! I cannot wait for my Art Philosophy cartridge to arrive! Love your card and love your flowers. I appreciate your explanation of how you made your flowers. Have to try this! How can you not love that witch, even her legs can make a card great! Wow, this card is just stunning! what a GREAT non-halloween use of this set! Super cute! I think those flowers are the prettiest I've seen. Love how you blinged them up. Gorgeous card! LOVE the card! I was hoping someone would use some other colours to make the legs less "witchy". And so great how you used the broom and hat swirls for other items- so creative! I hope I can try to remember to think more outside the box with my stamps! OMG this is such a beautiful card! Great work! I love what you did w/the cricut! !